NES Pin-Bot (USA) in 01:36.38 by link_7777 & Inzult. Pin-Bot is a pinball game developed by Rare. 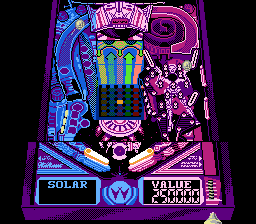 It is based on the 1986 pinball machine made by Williams. The game is played with a split screen; the bottom half of the screen remains on your flippers, while the top half scrolls to follow the ball(s) on the table. In addition to recreating the pinball game's table, lights, and sounds, several video game elements have been added, such as monsters that like to eat pinballs. link_777 and Inzult beat the highest default score in record time.